Companies pay for poor ergonomics in the plant through worker compensation insurance premiums, and, of course, in productivity losses as people are sidelined and unable to work. Poor ergonomics causes fatigue, which can directly lead to injuries, errors, and reduced productivity. Many of our clients treat ergonomics as seriously as they do accident prevention, which is the rational thing to do. The good news: ergonomics and productivity are best friends. Research makes it clear that a program of ergonomic improvements can reduce physical demands and increase operational productivity. Aside from the obvious benefit of a healthier, less expensive workforce, a good ergonomics program can help you see ways to improve product placement, material flow, processes, and labor. It’s one of the easiest “win/win” scenarios around. In general, you should strive to reduce or eliminate floor-level lifting. stretching to reach loads above/below arm level, and putting people in positions that require excessive bending or stretching over long periods of time. Walk your plant floor, and look for awkward postures. Are people routinely stooping or stretching to reach an area, pick an order, assemble a kit? Monitor your workflow for repetitive motion. If a function requires reaching, carrying things or lifting them all the time, it’s worth examining for revision. Find and reduce forceful exertions. Heavy duty lifting and manipulation of heavy loads is a workers’ compensation case waiting to happen. Are loads such that anyone in the plant can execute the job? One of our clients designed their operation so that anyone in the plant–whether built like a linebacker or a ballerina–can physically handle every job. This concept reduces forceful exertions for everyone involved–and creates tremendous labor flexibility. Look for pressure point problems. Do people lean against hard parts or surfaces that may have sharp edges? Static postures are harmful postures. Modern research tells us sitting at a desk all day is hard on people. Any fixed position or posture, including standing on a plant floor in the same position, is ergonomically unsound. Monitor available information & engage your workers: Read through written records of strains, worker compensation, OSHA 300 logs, or other documentation. Call team meetings to discuss ergonomics. What you think you see on the plant floor probably isn’t the entire picture. Ask them where the problem areas are, and work with them to find a better way to handle those situations. Use available tools. NIOSH publishes an assessment checklist that helps you structure this type of ergonomics audit (PDF file; opens a new window). It is not comprehensive, but it is an excellent starting point for plant ergonomics programs. Follow safe guidelines for lifting. In general, this means that items should be lifted close to the body, powered by leg muscles rather than back muscles. This assumes the weight is at an acceptable level. According to NIOSH, the maximum individual weight anyone should lift two-handed, under ideal conditions, is 51 pounds. Doing that many times over a work shift is hardly ideal. See related article: “Why Warehouse Workers Ignore Safe Lifting Advice”. Utilize lifting equipment to raise and lower loads rather than muscle power. Scissor lifts are ideal for these situations. So are hoists, balancers, and other powered methods to manipulate loads. You trade flexibility for ergonomics, but you can recoup that investment with a significantly fresher, less stressed, more energetic workforce and strain/injury reduction. Some solutions to the flexibility issue include utilizing carts or powered portable stackers that help reduce load handling by hand. Rotate and tilt loads to workers to discourage awkward reaching. Rotating tables, pallet positioners, carts and other equipment help encourage healthy ergonomics by delivering the load to the worker. Ideally, you’d have a rotating/lifting combination that always presents workers with the load in the best possible position. Install tilters to help dump or load bulk loads so they are easier on the people processing them, rather than reaching into deep bins for components. Use platforms, steps, and ladders to reduce reaching. Portable or fixed work platforms help workers utilize the “power zone” (between their knees and shoulders). This means that workers should grasp loads 30 to 40 inches from her standing surface. 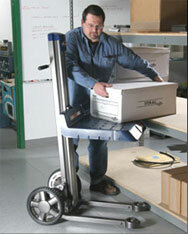 Adjustable height workstations are another way to keep the load in the power zone. Deliver goods to pickers. The idea of most goods-to-person picking systems is to increase pick speeds, but one of the reasons speeds are increased is that workers aren’t wearing themselves outreaching deep into shelves or trotting around a warehouse. Although you would never install a vertical lift module strictly on ergonomics, you’d reap ergonomic benefits from day one. An intermediate step is to utilize carton flow racks or tilt shelves for workers and minimize the amount of reaching involved. Reduce the chances of scrapes, trips, and bumps. Although this isn’t ergonomic in the strictest sense, taking steps to avoid bumps, scrapes, and cuts is relatively easy and pays dividends. Make sure sharp metal edges aren’t exposed whenever possible. Require bumper or edge guards to protect people in areas where they may cut or bruise themselves on these types of hazards. Use bright, highly visible signs or labels on low-hanging obstacles. Clearly mark tripping hazards.